Jacobian matrices are a super useful tool, and heavily used throughout robotics and control theory. Basically, a Jacobian defines the dynamic relationship between two different representations of a system. For example, if we have a 2-link robotic arm, there are two obvious ways to describe its current position: 1) the end-effector position and orientation (which we will denote ), and 2) as the set of joint angles (which we will denote ). The Jacobian for this system relates how movement of the elements of causes movement of the elements of . You can think of a Jacobian as a transform matrix for velocity. where and represent the time derivatives of and . This tells us that the end-effector velocity is equal to the Jacobian, , multiplied by the joint angle velocity. Why is this important? Well, this goes back to our desire to control in operational (or task) space. We’re interested in planning a trajectory in a different space than the one that we can control directly. Iin our robot arm, control is effected through a set of motors that apply torque to the joint angles, BUT what we’d like is to plan our trajectory in terms of end-effector position (and possibly orientation), generating control signals in terms of forces to apply in space. Jacobians allow us a direct way to calculate what the control signal is in the space that we control (torques), given a control signal in one we don’t (end-effector forces). The above equivalence is a first step along the path to operational space control. As just mentioned, though, what we’re really interested in isn’t relating velocities, but forces. How can we do this? Conservation of energy is a property of all physical systems where the amount of energy expended is the same no matter how the system in question is being represented. The planar two-link robot arm shown below will be used for illustration. Let the joint angle positions be denoted , and end-effector position be denoted . where is work, is force, and is velocity. where is the Jacobian for the end-effector of the robot, and represents the forces in joint-space that affect movement of the hand. This says that not only does the Jacobian relate velocity from one state-space representation to another, it can also be used to calculate what the forces in joint space should be to effect a desired set of forces in end-effector space. First, we need to define the relationship between the position of the end-effector and the robot’s joint angles, . However will we do it? Well, we know the distances from the shoulder to the elbow, and elbow to the wrist, as well as the joint angles, and we’re interested in finding out where the end-effector is relative to a base coordinate frame…OH MAYBE we should use those forward transformation matrices from the previous post. Let’s do it! Recall that transformation matrices allow a given point to be transformed between different reference frames. 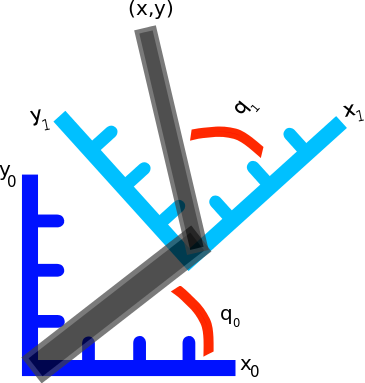 In this case, the position of the end-effector relative to the second joint of the robot arm is known, but where it is relative to the base reference frame (the first joint reference frame in this case) is of interest. This means that only one transformation matrix is needed, transforming from the reference frame attached to the second joint back to the base. The translation part of the transformation matrices is a little different than before because reference frame 1 changes as a function of the angle of the previous joint’s angles. From trigonometry, given a vector of length and an angle the position of the end point is defined , and the position is . The arm is operating in the plane, so the position will always be 0.
which transforms a point from reference frame 1 (elbow joint) to reference frame 0 (shoulder joint / base). which is the position of the end-effector in terms of joint angles. As mentioned above, however, both the position of the end-effector and its orientation are needed; the rotation of the end-effector relative to the base frame must also be defined. Fortunately, defining orientation is simple, especially for systems with only revolute and prismatic joints (spherical joints will not be considered here). With prismatic joints, which are linear and move in a single plane, the rotation introduced is 0. With revolute joints, the rotation of the end-effector in each axis is simply a sum of rotations of each joint in their respective axes of rotation. Once the position and orientation of the end-effector have been calculated, the partial derivative of these equations need to be calculated with respect to the elements of . For simplicity, the Jacobian will be broken up into two parts, and , representing the linear and angular velocity, respectively, of the end-effector. Once the Jacobian is built, it can be analysed for insight about the relationship between and . No matter what the values of , it is impossible to affect , , or , because the corresponding rows during the above multiplication with the Jacobian are . These rows of zeros in the Jacobian are referred to as its `null space’. Because these variables can’t be controlled, they will be dropped from both and . Looking at the variables that can be affected it can be seen that given any two of the third can be calculated because the robot only has 2 degrees of freedom (the shoulder and elbow). This means that only two of the end-effector variables can actually be controlled. In the situation of controlling a robot arm, it is most useful to control the coordinates, so will be dropped from the force vector and Jacobian. But we’ll stick with control of the and forces instead, as it’s a little more straightforward. With our Jacobian, we can find out what different joint angle velocities will cause in terms of the end-effector linear and angular velocities, and we can also transform desired forces into torques. Let’s do a couple of examples. Note that in the former case we’ll be using the full Jacobian, while in the latter case we can use the simplified Jacobian specified just above. And so the end-effector is linear velocity is , with angular velocity is . So given the current configuration to get the end-effector to move as desired, without accounting for the effects of inertia and gravity, the torques to apply to the system are . And now we are able to transform end-effector forces into torques, and joint angle velocities into end-effector velocities! What a wonderful, wonderful tool to have at our disposal! Hurrah for Jacobians! In this post I’ve gone through how to use Jacobians to relate the movement of joint angle and end-effector system state characterizations, but Jacobians can be used to relate any two characterizations. All you need to do is define one in terms of the other and do some partial differentiation. The above example scenarios were of course very simple, and didn’t worry about compensating for anything like gravity. But don’t worry, that’s exactly what we’re going to look at in our exciting next chapter! Something that I found interesting to consider is the need for the orientation of the end-effector and finding the angular velocities. Often in simpler robot arms, we’re only interested in the position of the end-effector, so it’s easy to write off orientation. But if we had a situation where there was a gripper attached to the end-effector, then suddenly the orientation becomes very important, often determining whether or not an object can be picked up or not. And finally, if you’re interested in reading more about all this, I recommend checking out ‘Velocity kinematics – The manipulator Jacobian’ available online, it’s a great resource. Reblogged this on Exoskeleton Project Blog. can do! thanks for the notice that it was down! What a great post! The second I saw your website, I knew I’ll be a frequent visitor. Thanks for the quality posts. thank you very much for the kind words! glad you enjoy! Thank you for a good and informative article. I have a question regarding the angular velocity jacobian, in the “Partial diffentiation” section. J_w(q) = dw/dq, so if you multiply this part of the jacobian with dq, would you not end up with dw, which is angular acceleration and not w? Yup, dw = J_w(q)dq. I gave a quick scan for a typo but didn’t find it, is there a particular part that’s confusing? Ah, is it in using J_w instead of J_alpha, where alpha represents angular velocity? If I compare with the velocity jacobian, J_v(q)= dx/dq, then J_v*dq = dx = v, it ends up giving the velocity. J_w(q)=dw/dq, here J_w(q)*dq = dw = alpha. It gives the angular acceleration, but J_w(q) should give angular velocity w? Ah, sorry it’s been a while since I wrote this and I forgot my own notation. So the Jacobian is defined between velocities, so the equation is not dw = J_w(q)*dq as I said in my last comment, but w = J_w(q)*dq, because w itself is d ang/dt, where ang is angular position . Excellent information thanl you, I have a question , what happens if I want to find the jacobian between two point in the robot. For example I want to find the jacobian of a 5 DOFS biped robot (2 DOFS per leg and the Torso) between the foot o the robot and the COM (center of mass) how can I obtain the jacobian between this two parts. Could you help me? Thank you, I have a question, I need to find the transformation matrix only for the foot to the torso (3 DOFS) or I need to have the transformation matrix of all the system (5 DOFS)??? You’ll need to have the transformation matrix for the whole system between the torso and foot, because movements of each of these joints will affect the force at the foot. Find the transformation matrix between each successive joint, and then multiply them together to get the transformation matrix for the whole system (from torso to foot). Can you also find the position and orientation by finding the RPY angles of the rotational part from the homogeneous transformation matrix,then pulling the translational part from the transformation matrix, then store these three RPY angles and these three elements from translation part, in a 6×1 extended vector, is that the same too?, the jacobian Jee you computed is the analitical jacobian for the final effector, right? I’m not sure I understand what you’re proposing; you could store the information in a 6×1 matrix, but then you’d have to extract and process it in a specific way, rather than just performing the matrix multiplications, to move from reference frame to reference frame. Another method is storing the information and doing rotation / translation is with dual quaternions if you’re looking for a more efficient representation! And yes, the Jee is the Jacobian for the end-effector. Hope that helps! Thanks for your reply, well with the extended vector i meant the pose of the end effector, but in this case, are you using Jee to map dq to the twist? or to map to the pose derivative? while Jacobians are defined by mapping joint angle velocities to end-effector velocities at the beginning of the post, we go on to use Jee to transform forces applied to the end-effector into joint torques. The answer is yes since RPY, or Euler angles for example, are quantities that can be differentiated. However the presentation given here is only applicable to special cases, such as the planar motion case, where angular velocity can be integrated. Except for the special cases angular velocity is not the derivative of any function so there is nothing to differentiate to get a matrix of partials. The well-known dynamicist Whittaker refers to non-existent quantities like this as quasi-coordinates. Thanks a lot for your post. I’ve a question as this topic is new for me, what is the diff between Part1 & Part2. In other words between calculate X by knowing Q in case of forward dynamics & Jacobians. you can use forward transformation matrices to calculate the position of the end effector given the angles of the joints, and you can use the Jacobian to calculate both the velocity of the end-effector given the angular velocities of each of the joints, and the torques to apply to each of the joints given a desired end-effector force. What is a null vector? How can we calculate a null vector for a given robot configuration? Addressed in exciting part 5! Hi, Great post! Better than most text books. Got a doubt, in the section ‘Accounting for orientation’, you have mentioned [w_x, w_y, w_z] = [0,0, q0+q1]. where, q0 and q1 are joint positions right? But you have mentioned w as angular velocity. That part was not exactly clear. Could you please clarify? thanks for the catch! That should be ‘angular rotation’, and I’ll fix that now! It’s used in the part of the Jacobian that calculates angular velocity, like how the position information is used in the part of the Jacobian that calculates the linear velocity. Does that help? Hi Travis, yes that helps. Hi Travis. Awesome blog. I seem to be having some issues with the moore penrose method for solving the Jacobian. I get some very erratic results when increasing the number of joints in the simulation. For example, it works well with 2 revolute joints, but fails horribly with 7 spherical joints. Have you experienced anything similar? Oof, how does it work with 2 spherical joints? Or one? I have only had experience enough with spherical joints to know I avoid them when possible! the two spherical direcly maps to 6 degrees for freedom, so 6×6 jacobi – which gets psuedoinversed well. Above that it falls to bits. Im just wondering if its my matrix math thats letting me down for the solve. eg. a fullpuvlu solve to determine the joint angles. Hmm, stepping back a second: why are you find the inverse of the Jacobian? im attempting to solve for an n sized system, the required joint angles. The transpose method works fine, but i want to be able to inject joint limits into this, so i want to solve the moore penrose version as well. eg ∆θ = J†~e. Ahh, sorry I have no insights off hand that could be helpful. Please let me know what you find out though! P ( Power) should be F^T V , there is no time derivative in the definition of P.
oof! that’s a big typo, thanks for catching it! Hi ! Your work is very useful. However I have a problem in the orientation part. You take a simple example of two joints. In this case, the angular angles are simple to calculate, but it is not always the case. Does it exist a method to calculate these angles with the rotation part of the transformation matrix ? Hello! Sorry I’m not sure I understand your question, could you rephrase it for me, please? Yup, the rotation part of the transformation matrix (i.e. T[0:3, 0:3]) specifies the orientation. Once you have it calculated you can use it to get Euler angles or the quaternion, whichever orientation format you want. Omg! at last i understand what the jacobian is. Thanks for the really good explanation. Hello and thanks for the sharing so much information! I have been thinking of planning movements in the operational space, say moving the robot from point A to B. If the planner only considers the geometrical path in the operational space, then I see a constant path speed, but joints speeds might be too high. Do you know if and how the joint dynamics can be taken into account (maybe through the Jacobian?) and reduce the path speed when necessary? I hope you understand what I mean. Thanks for your help! It limits the velocity of the end-effector in operational space, which in turn can prevent the controller specifying torques the motors can’t match. It will require a bit of playing around with to find the right limits but I think it’s what you’re looking for! Thanks for the explanation, it helps a lot! I thought the result would turn out the same nonetheless, but when I applied it to different system it becomes different. It might be my error in calculating the Jacobian, but what’s your thought in this matter? hmmm yup those should be the same, unfortunately I think you might have an error in your calculations! As I understand it you’ve got something like T01 * T12 * x, where x = [0, 0], rather than T01 * x with x = [l1*cos(q1), l1*sin(q1)]? In both cases you should end up with equivalent expressions. Hi, this is a very useful topic for me. It helps me to understand how to get the angular velocity of the end effector. Now, I want to calculate end effector angular acceleration. So, can we get it simply by taking derivative of the angular velocity of end effector? Or we need to do some other calculation? Hi Sharmila, yup you can calculate it by taking the derivative of , which works out to . They discuss computing here. Essentially, to get dJ[i, j] you take J[i, j] and differentiate with respect to each joint, then sum all the results. Hope that helps! Hello, I’m afraid I don’t understand your question. Could you rephrase it for me? I wanted to control my end effector position without doing the inverse kinematics and controling the force using a PD controller. How do I do that? I have a 3link arm and would like the last link to be horizontal while moving vertically.